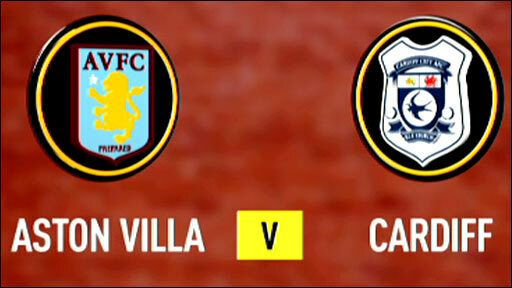 Gabriel Agbonlahor's third-minute goal booked Aston Villa's place in the fourth round of the Carling Cup. Agbonlahor back-heeled John Carew's low near-post cross after Cardiff had clumsily lost possession in midfield. Gabor Gyepes and Joe Ledley headed just over for Cardiff, and Jay Bothroyd's late effort was ruled out for offside. James Milner wasted a glorious chance to put the game to bed early in the second half when he hit the post from the penalty spot after Gyepes's foul. For the second game in succession, there was no place for Nigel Reo-Coker in the Villa squad after a training-ground row with manager Martin O'Neil. Cardiff included three former Aston Villa players in their starting XI, and it was a mistake from one of those Villa old boys that led to the opening goal. Riccardo Scimeca was the culprit as his misplaced pass allowed Carew to race 40 yards down the right flank unchallenged before finding Agbonlahor at the near post. The striker's first-time back-heel flick gave goalkeeper Peter Enckelman - another returning to his old stomping ground - no hope. Cardiff responded well as Gyepes and Joe Ledley headed just over in quick succession, while Gavin Rae's deflected shot warmed Brad Guzan's hands in the Villa goal. With Bothroyd used as a lone striker, the visitors made the most of the extra man in midfield and caused their hosts plenty of problems from free-kicks and crosses into the box. But the decisive touch was missing and the half ended with Stiliyan Petrov forcing Enckelman into his first save of note. Villa almost started the second half as they had the first, but Carew could not match his strike partner's accuracy as he headed an inviting Milner cross wide. The visitors were then handed an even bigger let off on 58 minutes when Milner's penalty hit the post after Petrov had been felled by Gyepes. Cardiff's response was to send on top-scorer Michael Chopra from the bench. The change had little effect as the meanest defence in the Premier League stood firm to secure victory, but they were thankful for a marginal offside decision which denied Bothroyd and the need for extra time. 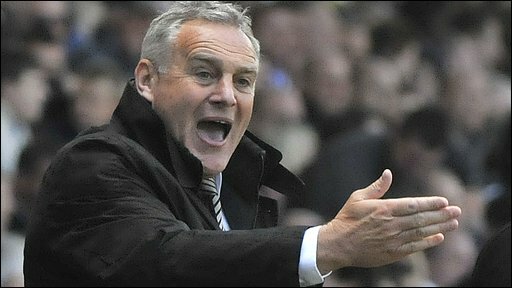 "I think that Cardiff were never out of it, and played some nice football, but we seemed to be in reasonable control, and I am delighted to have won and avoided another defeat in the competition. "Agbonlahor is on fire at the moment, he is playing brilliantly for us. He has got so much confidence now. "The goal he scored was maybe the sort he would not have attempted three-quarters of the way through last season, but he has so much confidence." "I spoke to the referee, and I asked the linesman about it (Bothroyd's disallowed goal). I was well behaved, but I thought it was a goal. "He was not offside. But I know I will get many decisions for me and many against me, and, because of the way we played, I am probably being a bit more diplomatic. "I was very pleased with our performance, particularly after going a goal down after only three minutes. "It was a big blow to us, but we recovered from that and passed the ball better than at the weekend, and overall everyone on my side did well." 90:00+3:57 The referee blows for the end of the match. 90:00+2:48 The referee blows for offside against Jay Bothroyd. Indirect free kick taken by Bradley Guzan. 90:00+2:19 Free kick awarded for an unfair challenge on Joe Ledley by Marc Albrighton. Tony Capaldi delivers the ball from the free kick left-footed from left channel, clearance by James Collins. 89:40 Nicky Shorey is caught offside. Indirect free kick taken by Peter Enckelman. 89:14 Substitution Aaron Wildig replaces Gavin Rae. 88:19 Foul by Joe Ledley on Fabian Delph, free kick awarded. Direct free kick taken by James Milner. 86:23 Corner taken left-footed by Fabian Delph from the right by-line, save by Peter Enckelman. 86:15 The ball is sent over by Marc Albrighton, Anthony Gerrard manages to make a clearance. 84:27 Free kick awarded for a foul by Peter Whittingham on Stiliyan Petrov. James Milner takes the direct free kick. 82:55 The ball is swung over by Marc Albrighton. 81:31 The referee blows for offside. Nicky Shorey takes the indirect free kick. 80:42 The ball is delivered by Gabriel Agbonlahor. 79:42 The ball is crossed by James Milner, clearance by Anthony Gerrard. 78:34 Substitution Craig Gardner leaves the field to be replaced by Marc Albrighton. 77:52 Handball decision goes against James Milner. Peter Whittingham delivers the ball from the free kick left-footed from right wing, clearance by Craig Gardner. 76:31 Adam Matthews produces a shot on goal direct from the free kick, Stiliyan Petrov gets a block in. 76:31 Booking Habib Beye is booked. 76:13 Habib Beye challenges Peter Whittingham unfairly and gives away a free kick. 73:20 Carlos Cuellar challenges Jay Bothroyd unfairly and gives away a free kick. Peter Whittingham has a direct shot on goal from the free kick, save by Bradley Guzan. 71:55 The ball is delivered by Craig Gardner. Correction - 70:54 The ball is sent over by James Milner, clearance made by Gabor Gyepes. 70:54 James Milner produces a cross, clearance made by Anthony Gerrard. 67:51 Chris Burke takes a shot. Save made by Bradley Guzan. 67:07 The ball is crossed by James Milner, Header by Gabriel Agbonlahor from deep inside the penalty area misses to the right of the target. 65:55 Fabian Delph takes a shot. Save by Peter Enckelman. 65:27 Inswinging corner taken from the left by-line by James Milner. 62:01 Peter Whittingham takes a shot. Carlos Cuellar gets a block in. 61:34 A cross is delivered by Chris Burke, clearance by Gabriel Agbonlahor. 60:46 The free kick is delivered right-footed by Adam Matthews from left channel, clearance made by Habib Beye. 60:46 Booking The referee cautions Fabian Delph for unsporting behaviour. 60:42 Free kick awarded for an unfair challenge on Peter Whittingham by Fabian Delph. 59:13 Substitution Michael Chopra joins the action as a substitute, replacing Riccardo Scimeca. 57:56 Penalty missed right upright by James Milner. 57:56 Booking Booking for Gabor Gyepes. 57:27 Penalty awarded for a foul by Gabor Gyepes on Stiliyan Petrov. 55:47 Habib Beye crosses the ball. 53:57 James Milner crosses the ball. 53:12 Adam Matthews delivers the ball, save by Bradley Guzan. 53:04 Chris Burke crosses the ball, Craig Gardner makes a clearance. 51:50 Free kick awarded for a foul by Fabian Delph on Riccardo Scimeca. Gabor Gyepes takes the free kick. 51:17 Foul by Gavin Rae on Stiliyan Petrov, free kick awarded. Stiliyan Petrov restarts play with the free kick. 49:59 Craig Gardner gives away a free kick for an unfair challenge on Jay Bothroyd. Peter Whittingham crosses the ball from the free kick left-footed from left channel. 49:09 Gavin Rae gives away a free kick for an unfair challenge on Stiliyan Petrov. Free kick taken by Stiliyan Petrov. 48:21 Jay Bothroyd is ruled offside. Free kick taken by James Collins. 48:07 Peter Whittingham fouled by Fabian Delph, the ref awards a free kick. Free kick taken by Joe Ledley. 47:48 Gabor Gyepes concedes a free kick for a foul on Gabriel Agbonlahor. Stiliyan Petrov takes the free kick. 47:12 James Milner delivers the ball, John Carew produces a header from inside the area that goes over the crossbar. 45:00+1:00 The whistle is blown to end the first half. 44:58 The ball is sent over by James Milner, clearance by Gabor Gyepes. 43:54 The ball is swung over by Gabriel Agbonlahor, save made by Peter Enckelman. 42:29 Stiliyan Petrov takes a shot. Peter Enckelman makes a save. 42:11 The ball is swung over by James Milner, Anthony Gerrard makes a clearance. 37:16 Jay Bothroyd takes a shot. Blocked by Carlos Cuellar. 34:41 Inswinging corner taken by James Milner, Header by John Carew from deep inside the penalty area misses to the right of the target. 34:25 The ball is swung over by Peter Whittingham, Jay Bothroyd takes a shot. Save by Bradley Guzan. 32:51 The ball is crossed by James Milner. 31:17 The ball is delivered by James Milner, Peter Enckelman makes a save. 29:35 Inswinging corner taken left-footed by Fabian Delph played to the near post. 29:29 The ball is swung over by Habib Beye, clearance made by Gabor Gyepes. 29:21 Centre by Nicky Shorey. 27:18 Inswinging corner taken right-footed by Adam Matthews played to the near post. 26:56 Corner taken by Peter Whittingham, clearance by Carlos Cuellar. 26:46 The ball is delivered by Peter Whittingham, blocked by Nicky Shorey. 24:57 A cross is delivered by Fabian Delph, Headed effort from deep inside the penalty area by Gabriel Agbonlahor misses to the right of the target. 24:26 Peter Whittingham crosses the ball, clearance made by Carlos Cuellar. 23:23 Jay Bothroyd has a shot on goal from outside the area which misses right. 21:10 The ball is crossed by Peter Whittingham, clearance by James Collins. 20:06 James Milner is caught offside. Peter Enckelman restarts play with the free kick. 17:58 Foul by Gabriel Agbonlahor on Adam Matthews, free kick awarded. Peter Enckelman takes the free kick. 16:51 Free kick awarded for an unfair challenge on Carlos Cuellar by Jay Bothroyd. Direct free kick taken by Nicky Shorey. 15:15 Centre by James Milner, Peter Enckelman makes a save. 14:13 Centre by Chris Burke. Correction - 13:56 Corner taken left-footed by Peter Whittingham, Joe Ledley takes a shot. Save made by Bradley Guzan. 13:56 Corner from right by-line taken by Peter Whittingham. 13:41 Jay Bothroyd takes a shot. Nicky Shorey manages to make a clearance. 13:12 Gavin Rae takes a shot. Save by Bradley Guzan. 12:26 Foul by Gabriel Agbonlahor on Adam Matthews, free kick awarded. Direct free kick taken by Adam Matthews. 11:16 James Milner takes a shot. Save by Peter Enckelman. 10:23 Inswinging corner taken right-footed by James Milner, Jay Bothroyd manages to make a clearance. 10:09 James Milner takes a shot. Adam Matthews gets a block in. 9:54 Short corner taken by James Milner from the left by-line. 9:41 Fabian Delph has an effort at goal. Blocked by Gabor Gyepes. 8:47 Header from deep inside the area by Gabor Gyepes goes over the bar. 8:17 Foul by Carlos Cuellar on Chris Burke, free kick awarded. Peter Whittingham takes the direct free kick. 5:03 The ball is delivered by Tony Capaldi, clearance made by James Collins. 4:47 Jay Bothroyd produces a cross, Carlos Cuellar manages to make a clearance. 4:02 A cross is delivered by Peter Whittingham, clearance by James Collins. 2:53 Assist by John Carew. 2:53 GOAL - Gabriel Agbonlahor:Aston Villa 1 - 0 Cardiff Gabriel Agbonlahor gets on the score sheet with a goal from inside the area to the bottom left corner of the goal. Aston Villa 1-0 Cardiff.